Ever since I learned that Gerald and Shakespeare both mean "spear chucker," I've had a long-standing Jones for the Bard. Quite coincidentally, a colleague recently suggested that I'd enjoy anything written by Bill Bryson. My friend suggested A Walk in the Woods or A Short History of Nearly Everything. The first sounded too much like a mossy travelogue and the ambitious scope of the second seemed far too cumbersome for casual sampling. So Bryson's biography, Shakespeare: The World As Stage, was the irresistible choice for me. I can now agree that Bryson may be the most entertaining nonfiction writer I've ever read. He dares to be a stylist in these days of plain-vanilla journalism, and that is praiseworthy in itself. Perhaps it's in the blood: His father was a sportswriter with the flair of an H. L. Menken or a Heywood Hale Broun. Apparently Bryson was assigned to write Shakespeare as an entry in the Eminent Lives series from Atlas Books (a HarperCollins imprint, a News Corporation subsidiary, a Viacom competitor, and a prize possession of Rupert Murdoch et al). Right off, Bryson seems bewildered that so much material has been generated about the most illustrious English dramatist -- and most of it on scanty and even nonexistent evidence. You can almost hear Bryson implore, "I got stuck with writing this, now how do I fill a few hundred pages without making stuff up?" He starts by describing the Chandos portrait (shown here), and after tantalizing us with intriguing details about the wealth of the sitter (apparent from the dark clothes, which require lots of expensive dye) to the earring (as rakish on a man then as now), the embarrassed biographer bestows the fact that no one knows whether this most famous likeness is actually the person we've been told it is. Bryson chatters on, quite amusingly, making much ado about nothing as he overturns reams of research. Perhaps because statistics offer some hope of solid evidence, he informs us that Shakespeare's vocabulary included about 20,000 words. You probably know about 50,000, but today's world is a more complex place. But -- and here's the astounding factoid -- when Shakespeare couldn't find an appropriate word, he apparently made one up. In fact, Shakespeare contributed about 800 words to your 50K. Among these coinages are: abstemious, antipathy, assassination, barefaced, critical, eventful, excellent, frugal, indistinguishable, leapfrog, lonely, well-read, zany, and, as Bryson quips, countless others, including countless. Suffice it to say Shakespeare must have had a fairly deep knowledge of Latin and Romance-language root words and syllables, to so effectively concoct and combine new polysyllabic English ones. Is this more grist for the grinders who allege Shakespeare was in fact someone else? Bryson does not comment specifically, but he does a credible job of debunking various Baconian and Marlovian speculations later in the book. 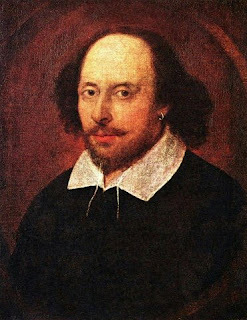 Shakespeare's turns of a phrase also enhanced the language. Many of his inventions are cliches of modern speech (Bryson's compilation): one fell swoop, vanish into thin air, bag and baggage, play fast and loose, go down the primrose path, be in a pickle, budge an inch, the milk of human kindness, more sinned against than sinning, remembrance of things past, beggar all description, cold comfort, to thine own self be true, more in sorrow than in anger, the wish is father of the thought, salad days, flesh and blood, foul play, tower of strength, pomp and circumstance, and foregone conclusion. The King James Bible was a new translation back then. Most spiritual and scholarly works were still being written in Latin. So the English Bible and Shakespeare's plays apparently contributed more to our daily discourse than you'd think. I plan to read lots more Bryson, and thanks to him I now admire William Shakespeare (whoever he was) more than ever.